yesterday i took a walk through my neighborhood. we are in full spring! 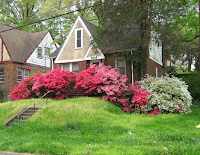 this is one of my favourite parts of living in takoma park. people here have a lot of plants, but they don't torture them into manicured shapes. they are natural and pretty. click to enlarge--these pictures are worth it! this is the house around the corner from me. they have amazing azaleas. they will peak later this week. pretty! this is a close up on an amzing tree some people down the street have in their front yard. 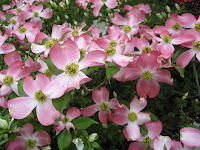 it is probably 40 feet high and full of blooms that drag all the way to the ground. science at work! this little field of bells across from my house shows natural hybridization. see the blue, white, and mix color? awesome. science still works! 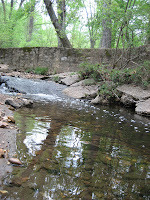 my neighborhood is call "Between the Creeks" because... well... we live between two creeks. i am at one extreme edge and this is the creek 100 yards from my front door. 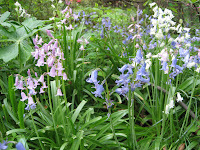 the bell flowers grow near it. 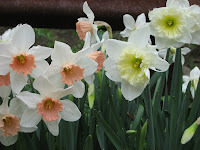 i love daffodils. aren't the peachy colored center neat? i've never seen them that color before. iris! look at it. these are very typical in ohio, but i almost never see them out here. when i was little we had a whole huge bed of them in the front yard and they smelled like grape candy to me. here there is one plant, and they don't smell. boo. 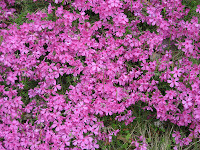 phlox! we had these in our yard when i was in high school. you also don't see a lot of them here, and they don't spread to be as big as they get in ohio. i think they like the special kind of nasty weather you can only get in ohio. 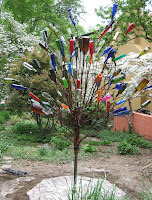 this is the bottle tree that the folks a block away keep. they put it in this fall, and it is colorful year round. i really want to know if they bought it finished or if they drank all of those bottles of wine to put on the tree. this weekend the weather out here finally broke and we had sunshine and flowers! 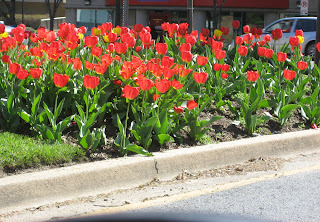 the tulips were in a median and i took the picture while i was parked in traffic. it was the highlight of rush hour. i had to work at the store on saturday, but it was okay. i went out to get my lunch which meant a little walk in the sunshine. and we did a pretty good day of sales. we had one $750 sale, so that was cool. those don't happen all that often, and it was a nice change of pace from explaining to people why certain yarns are "so expensive". i also made progress this weekend on my latest knitting project. this is the sleeve for Dane's birthday sweater. it is a drop shoulder sweater, which is why the sleeve doesn't have a cap. 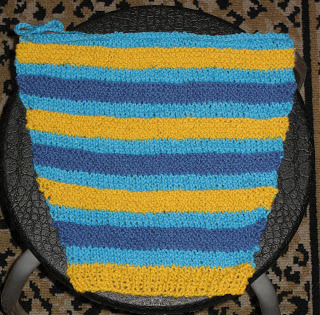 if you click to enlarge the photo, you'll see the yellow and royal stripes are garter stitch on the azure sockinette background. and look at the fun crinkly texture of the cotton yarn! this little darling came from Ms. PeonyKnits deciding she could make up the pattern for a sweater being sold at the store Anthroplogie for far too much money. (everything at Anthropologie is expensive, but it is beautiful!) it was inspired by their "First Frost Capelet" for sale in the Winter 2005 catalogue. 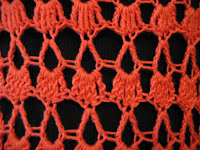 follow the link to PeonyKnits if you would like to see her original version. hers was knit in Rowan Polar in a cream color. Polar is now discontinued, so i went with the Baby Grande. i also decided i would get more wear out of black, even though the dress i made it to go with is cream and black. i only made one major change, which is the original is intended to be worn with the reverse sockinette side as the "right side" and i chose to have the sockinette side as my right side. i wasn't happy with how fuzzy and smashed the reverse sockinette got in this yarn. i suppose the Polar had less of this problem because it is an alpaca and acrylic blend, and i chose 100% fuzzy baby animal hair. alpaca is not a good choice for things needing a lot of stitch definition because it is very soft and smooshy, but it is excellent for items that need to be warm because it is very warm. and that was my main goal. 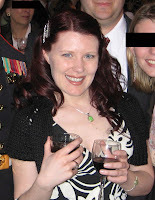 i made the shrug to wear to this wedding on a riverboat. and boy was it a last minute decision! i bought the yarn on a monday, finished the project on friday night, and then wore it last saturday. so i didn't get to block it, but i think it looked okay. and will look even better after i do get to block it! tonight at work i picked out the yarn for the gifty i plan to make for Dane's 1st birthday. i hope his mama likes it. it needs to be in ohio 3 months from tomorrow, so i should have plenty of time. i plan to cast on for it after i finish crocheting another gift this week. congratulations go out to thehairyape and all his pals in The Resistible Rise of Arturo Ui. monday night they won the Helen Hayes Award for Outstanding Ensemble. pictured to the left is thehairyape's "I won!" face. i think i will be seeing a lot of it for a while. also note, we both clean up awful pretty. this was a very special and exciting year at the awards because some results were highly unexpected. in past years there has been complaining about the same people always winning for doing the same old thing year after year. Congratulations, we love your mediocrity! Keep it up! this year a lot of first time nominees who worked their butts off won. there were also a couple of nominees who had been nominated up to 8 times (!?!) and never won--but they finally got their nod this year. in a typical year there are a few underdog nominees, and at the party afterward their friends are slapping them on the back and telling them they have been robbed. this year, i think a few people who were considered a sure thing, got to walk a mile in their shoes. i will say, however, that there were two "i'm honored, as usual, because i win this every year" speeches, and i am thinking daggers at those people. have some class--don't sound as rented as your tuxedo. here are the photos of monday night. enjoy! it has been a busy week and weekend! the album link below will take you to the photos i took at a wedding i attended on saturday. it was lovely, and i am extremely happy for the couple. i am friends with the groom from way back, and i am pleased to see him happy and with the right gal. check out the album to see wedding highlights including the cake being cut with my friend's military dress uniform sword! earlier in the week, one of my college roommates was in town checking out a PhD program. we had a great time catching up, and she brought photos of her little boy with her. here is the cutie pie. 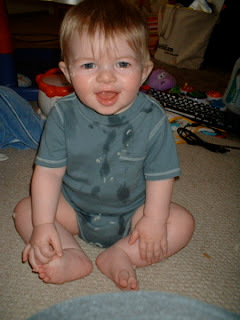 i'm keeping my fingers crossed that he will be moving here soon because his mama may be going to school near me soon! it is hard to eat an apple when you only have 2 teeth. stitched in 2 partial skeins of Colinette Yarns' Tagliatelli (90% merino wool, 10% nylon in colors Neptune and Florentina) on a "N" hook. this yarn is a really awesome merino wool tape yarn. it is like that junky ribbon yarn the bigger commercial companies put out, only of a much high quality. it feels really great to work with, and the colors are amazing. the skeins are all hand painted, and no two are totally identical. the pattern was designed to be made out of moda dea ticker tape, which is a very stretchy 100% nylon tape yarn. because the tagliatelli is less stretchy, i added two extra rows of mesh in the straps and one extra row of mesh in the side joining panels. i also decided to add more mesh in rounds at the bottom of the vest to make it a little bit longer--personal taste there. 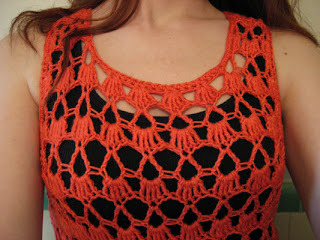 now that it is blocked and dry, i see that i didn't need the extra mesh at the sides, but it was needed for the straps. the extra mesh made the vest bigger than i need it to be, but it isn't big enough to be legitimately oversized. so it more or less has the effect of making me look 10 pounds heavier. ho hum. since that is the look i'm always going for. this reinforces my assertion that bulky or novelty yarns are not to be fully trusted. just like muffins and pizza. or it may suggest i have been trusting muffins and pizza more than i ought to lately. i made one other design change. 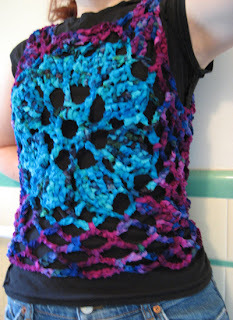 in order to show off the flower motif more, i decided to work the vest in two colors. the flower is done in Neptune, and the mesh that holds the motifs together is stitched in Florentina. we'll see how much i wear the vest. i know i will to work at the store... but otherwise, i may have to hang it on my wall and just admire how pretty it is. finally a new finished object. this is the store model i made to display at work. i apologize for the stupid pictures. it is very hard to photograph yourself, especially in full length. so the tunic is more flattering than the fatty picture would indicate. size small (long version) stitched in six balls of Plymouth Yarns Royal Bamboo (100% bamboo, color #40) on a size "H" hook. i really love this yarn. 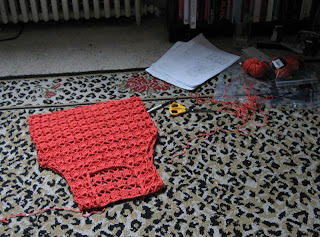 it works up very nicely, and it makes crocheted fabric that is super drapey and beautiful. it is a little harder to work with because it is plied, not twisted, but the drape is worth the extra care needed to catch all of the the threads. i am really into this book as well. i have started another project from the book already, and i think i may have to buy my own copy (i used the store's copy for these two projects) because it is too awesome not to own. the patterns are great, and most of them are relatively easy to make. i think there could be some christmas gifts in those pages. Doris Chan may be one of my new favourite designers. she has two patterns in the latest Interweave Crochet, and i want to make them both. the sugarplum bolero and simplicity top are both very yummy. 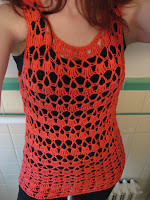 i like her designs because they are simple, elegant, and show off crochet to good advantage for garments. we have some progress on the store model. actually, we have a lot of progress. i have about four more rows to go in length and then the finishing. it looks shorter than the pictures, but it also has not been blocked--it really needs to be pulled down. i made my decision, i will not be keeping the model after the season. i'm taking store credit for my time instead. i made this choice for two reasons... 1. i don't look very good in this shade of coral. 2. i would have preferred the pattern to have some waist shaping. i could have worked it into the pattern, but i needed to make it the way the directions describe because it is for the store to display. i have a third reason, i guess. i would rather have the store credit for some other projects i want to make. the store model was a process project for me. i have come to see that i make two types of projects. process projects and product projects. a process project for me is something i see and say "i want to make that" without really considering if i would wear it or not. penguingirl's sweater or thehairyape's afghan were process projects. i really wanted to make them, but not so much for myself, which is why they were very easy to gift. i tend to make more product projects for myself. things i want to wear, so i will make them even if the knitting or crocheting is tedious and uninspiring. by golly... i will have the garment! the cupcake sweater is one of those projects. now, sometimes they can be one in the same. 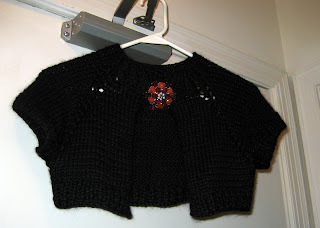 the short 'n sweet bolero i made was something i really wanted to make because i thought it would be fun to crochet, and because i reeeeeally wanted to wear it. i have a few of those coming down the pie, but i need to finish the model and a gift first. i'm very tired, and i took the morning off. i have had that "running on the last gallon of gas" feeling since last week. i'm hoping a few extra hours off will change that.